The basic idea behind cross drainage is to drain rainwater from fruit or vegetables over a larger area. This is achieved by defining a specific slope angle across the VOEN sheet and by setting up posts at two distinct heights along the length of the sheet. As a consequence, rainwater accumulates on the sheet in approx. ten-metre intervals to then be discharged into a trough mounted under the rain cover. For plot management purposes, plants are positioned across the VOEN covers in place – and so is the drain. Unlike conventional VOEN covers, the inter-row area is completely closed off by asymmetrical sheeting, thus preventing water run-off into the plot. The patented VOEN sheeting is made of overlapping plastic strips stitched onto a netting (for hail or insect protection). It comes with unique benefits: optimal microclimate thanks to constant air supply and strong resistance to stormy conditions. 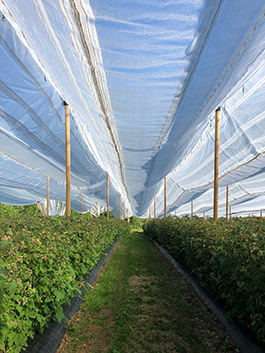 The area under the sheeting is automatically and constantly ventilated, giving the product a significant edge in terms of plant health and fruit quality. With this cross-drainage system, VOEN delivers a new economic alternative to costly protection systems. An innovative solution for crops requiring regulated water supply!